The General Ira C. Eaker Award denotes successful completion of all of the achievements of the Civil Air Patrol Cadet Program. This is CAP’s newest award for cadet achievement, implemented in December 1995. This award honors the late Air Force General Ira C. Eaker, aviation pioneer, career military officer, and one of the chief architects and visionaries of the US Air Force. The General Ira C. Eaker Award is the third milestone in the Cadet Program. 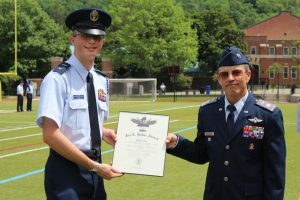 This award is earned after the receipt of the Amelia Earhart Award, completing all of the achievements in the cadet program, completing the Cadet Officer School (or equivalent), and passing a writing and speech requirement. Approximately 200 cadets per year receive this Award.